FREE promo from 17-20 October. • Been nervous about a promotion because it involved public speaking? • Been afraid to speak up in meetings? • Turned down an invitation to speak at your garden club or similar (or choked horribly in the attempt)? • Been unsure about proposing a toast, or introducing and thanking a speaker? • And yes, give eulogies. 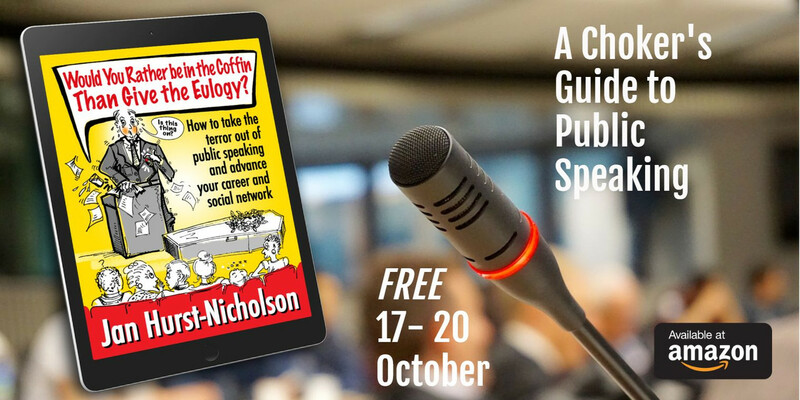 Jan Hurst-Nicholson has used her 35-year involvement in public speaking training, and her experiences giving talks at numerous events and organisations, to compile this practical guide. Uniquely geared towards the average person who does not aspire to become a professional speaker, (although there’s good stuff for them as well) but merely wants practical advice on speaking in public, (don’t drink anything fizzy before a speech) it is packed with meaty information that provides the tools for a better, confident you. Use them and you will soon have those butterflies flying in formation – and it might even change your life. *Makes a great graduation gift.